Only 5 days left to send your Diwali surprise! Diwali is one of the brightest festivals during the year where everyone is showered with love and gifts. It falls on 13th November 2012 this year , so the countdown has begun with just five days left! We bet you don’t want to miss the opportunity of sending a gift to your loved ones this year. 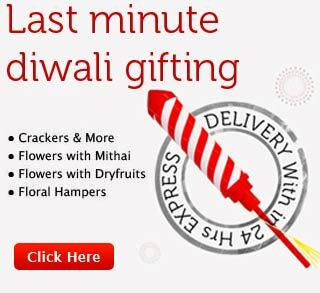 We have customized diwali hampers with a mix of traditional mithai, chocolates, flowers, crackers and cakes which can be delivered within 24hrs to reach in time for Diwali. This Diwali you may not be with your loved ones but through Tajonline.com you can send the perfect gift hamper of your choice. Should you want to go the extra mile and make a memorable gift, we have an exclusive Diwali gifts collection too. So send the best gift to your loved ones and make this Diwali a very special occasion!